I'm currently in my second semester here at Hope were I am a geology major. I'm originally from Pittsburgh, Pennsylvania. Some of my hobbies include skiing, stand up paddle boarding, camping, and basically anything fun and outdoors. Greetings, I am Max Huffman and at the moment I am in my second semester here at Hope College as a geology major and having the time of my life. I am from Pittsburgh, Pennsylvania and off campus I enjoy activities like skiing and hiking. On campus I’m part of geology club as well as the outdoor adventure club. But enough about me, I’m here to let you guys know a bit about Michigan Rocks, a class you can take part in as part of the Day1 program. The general idea of Michigan Rocks is that it is a class that starts before your freshman orientation begins. 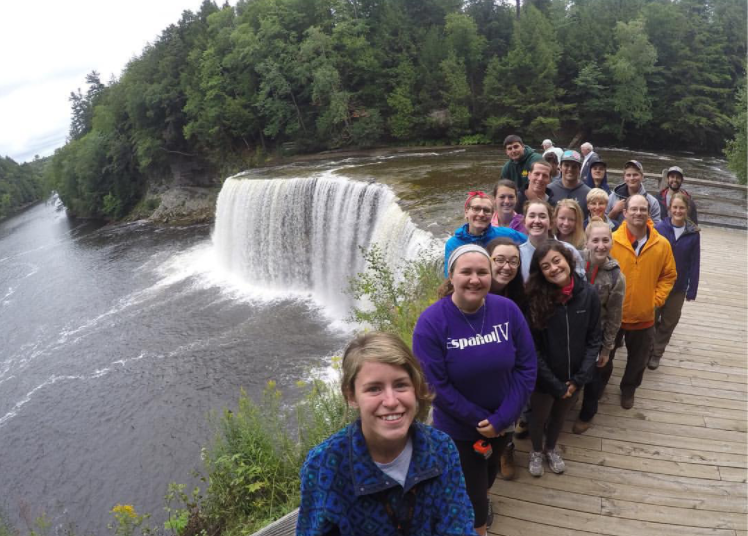 You will join fellow students on a 10 day trip to Michigan’s Upper Peninsula. While there you get the chance to do some pretty unique things (especially if you’re an out-of-state kid like me). You get the chance to do things like take the boat to Mackinac Island and bike around, all while learning about geological history. After that it’s off to the UP. You make stops at places like Pictured Rocks, Tahquamenon falls, and Copper Harbor, just to name a few! You also get to learn the basics of geology -from learning to identify rocks to understanding how the systems of our Earth actually work! So this course was my first real college experience and I have to admit I was nervous about the whole thing. It does seem intimidating to start college early and go camping with a bunch of strangers, but I can’t tell you how much this trip was really worth. It makes orientation seem like a breeze. Also since the bulk of this four credit class occurs before the official start of the fall semester you will come in with one of your classes almost completely done. (The class meets once a week for the first half of the fall semester after returning to campus.) Something that I thought really helped me make the transition from high school into college was the fact that you got to meet a very diverse group of people. Just because you aren’t interested in majoring in geology doesn’t mean you shouldn’t go. When I was on the trip I got to befriend fellow incoming students from a variety of majors, as well as some upperclassmen who decided to come. The upperclassman helped show us the ropes. Not only was it nice to form relationships with other students but it was really nice to get to know your professor too. It was great to see how genuine our professor was and how willingly and enthusiastically he shared his knowledge with us. I would highly recommend Michigan Rocks because Michigan does rock! Posted on March 9, 2016 March 13, 2016 Author Max HuffmanCategories Michigan RocksLeave a comment on Michigan Rocks!